Of all the countries surveyed in Western Europe, Austria appears to be the least inclined to use trade credit in transactions with business-to-business (B2B) customers. Over the past year, an average of 26.6% of the total value of Austrian respondents’ sales to B2B customers was made on credit. This figure, which does not differ significantly from that observed one year ago, is well below the 41.2% average for Western Europe. It is the lowest proportion of B2B credit-based transactions recorded in Western Europe. Survey respondents in Germany and Switzerland also showed a below average propensity to grant trade credit to B2B customers. Respondents in these countries reported an average of 30% or less of the value of their B2B sales being made on credit over the past year. As already noticed in past surveys, the similar approach to granting trade credit displayed by respondents in these countries may be a reflection of the similarities in their business cultures. Austrian respondents seem to be almost equally likely to grant trade credit to domestic and foreign B2B customers. 28.6% and 24.7% of the total value of domestic and foreign B2B sales respectively were made on credit (survey averages: 44.8% domestic and 37.7% foreign). This reflects an almost uniform perception of payment risk arising from domestic and foreign B2B trade. This is common to the majority of the countries surveyed in Western Europe. 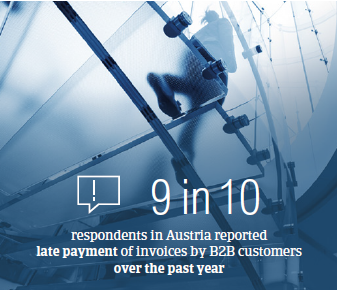 90.7% of Austrian respondents reported late payment of invoices by B2B customers over the past year. This resulted in an average of 36.4% of the total value of B2B receivables remaining unpaid by the due date (average for Western Europe: 40%). 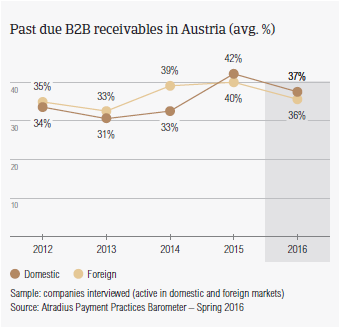 Over the past year, late payment of invoices by domestic and foreign customers of Austrian respondents has decreased by an average of 4 percentage points. Late payment of domestic and foreign invoices is reflected in the Days Sales Outstanding (DSO) figure reported by Austrian respondents. This averages 36 days (two days shorter than last year), and is markedly below the 48 days average for Western Europe. This may reflect greater efficiency in collecting high value long outstanding invoices than in most other Western European markets. 61.0% of respondents in Austria (63.7% in Western Europe) expect no change, in DSO over the next 12 months while a sizeable 30.0% expect an increase. This implies financial and administrative costs of carrying trade receivables. This may explain why a lot more respondents in Austria (30.5%) than in Western Europe (23.4%) overall consider cost containment to be the greatest challenge to profitability in 2016. 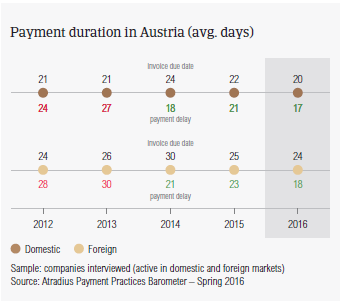 Payment terms extended to domestic B2B customers by respondents in Austria are the shortest observed in Western Europe. They average around 20 days from the invoice date, (survey average: 32 days). Foreign customers are given an average of 24 days for settling bills (survey average: 31 days). Compared to last year, these payment terms did not vary markedly. The short payment terms emphasize swift invoice payment and further demonstrate the lower level of comfort with extending credit than in other Western European countries. Respondents in Austria had to wait an average of two weeks past the due date for overdue invoices to be paid. This is one week earlier than average for Western Europe, and is an average of five days shorter than one year ago. As a consequence, it takes Austrian respondents an average of 40 days from invoicing to turn B2B credit sales into cash (survey average: 53 days). This is in line with what was recorded in Germany, Sweden, Denmark and the Netherlands. Almost the same percentage of Austrian respondents (58.3%) as those in Western Europe (57.9%) reported that late payment by domestic B2B customers is most often due to liquidity issues of the customers. Late payment of invoices from foreign customers due to this reason was reported by a lot more respondents in Austria (51.2%) than in Western Europe (40.2%). Consistent with the response rate of Western Europe overall, customers’ intentional use of outstanding invoices for financial advantage is the second most frequently cited reason for domestic and foreign late payment by respondents in Austria (around 30.0% of respondents). Complexity of the payment procedure was the third most frequently cited reason for foreign payment delay (28.5% of respondents). As a result of late payment, nearly twice as many respondents in Austria (around 21.0%) than in Western Europe (12.0%) said they had to delay investment, in property, plant and equipment. This is the highest percentage of respondents citing this of all the countries surveyed in Western Europe. To protect the business against payment default by B2B customers, more respondents in Austria (40.0%) than in Western Europe (33.7%) plan on checking their customers’ creditworthiness and payment history more frequently over the next 12 months. Around 36.0% of Austrian respondents (29.0% of respondents in Western Europe) plan to both monitor their customers’ credit risk and request secured forms of payment from B2B customers more this year. 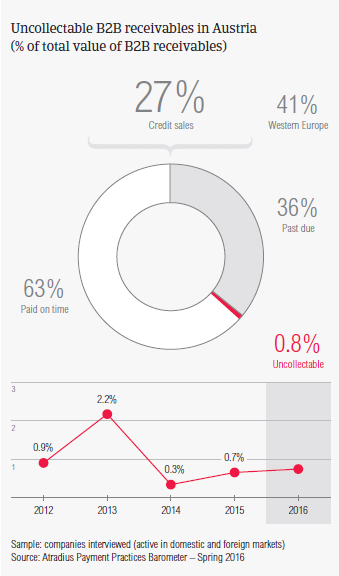 The proportion of B2B receivables reported by Austrian respondents as uncollectable (0.8%) is notably below the 1.3% average for Western Europe. Domestic uncollectable receivables were written off almost as often as foreign ones. Uncollectable domestic B2B receivables originate most often from the construction, consumer durables and services sectors. For a lot more respondents in Austria (71.5%), than in Western Europe (59.3%), B2B receivables were uncollectable mainly due to the customer being bankrupt or out of business. Around one in five Austrian respondents reported that write-offs were made because the costs to pursue the trade debtors were too high. This is in line with the response rate in Western Europe. 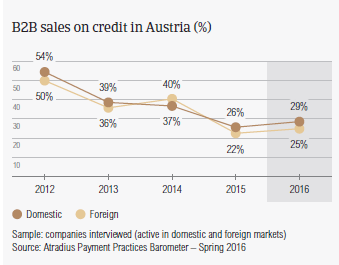 Respondents in Austria reported granting trade credit terms mainly to B2B customers belonging to the consumer durables, construction and services industries. Longer than average (for the country) invoice payment terms are extended to B2B customers in the construction industry (averaging 25 days from invoicing). B2B customers in the consumer durables sector settle past due payments the slowest (just over two weeks past due). The construction industry generated an above average (for the country) proportion of overdue invoices. When it comes to the reason for payment delay, most of the respondents in Austria (66%) said that customers in the consumer durables industry delay payments most often due to liquidity issues. 46% of the respondents in Austria expect payment practices of B2B customers in the construction industry to deteriorate over the coming months. No significant change is anticipated in the payment practices of other industries.